Mentors are an important source of inspiration and often cause more rapid attainment of goals with any endeavor. Optimally, you’ll find two mentors to help with transition - one whose transgender - and the other whose a born-female. Think back a moment. In reality, we usually learned to become men - from other men: fathers, brothers, cousins, neighbors and childhood friends. Lack of skill in this regard is why we quickly spot immaturity. You’ll require that same sort of evolutionary training in your journey to become female. Ideally, you’ll find at least one born-woman willing to offer key advice in this journey. The most challenging aspect in this regard often isn’t finding such a key mentor but rather, heeding her advice & taking criticism as constructive input. I transitioned at thirty nine years old. Thus, I didn’t get a chance to adorn those fun fashions for “20-somethings”. Guess what? I wore them anyway - which of often made me look ridiculous and was a source of friction between myself and my born-female mentor. 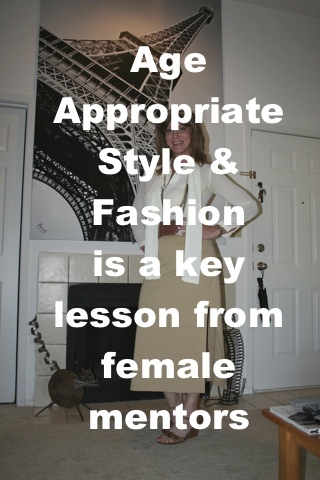 Beginning transgender women are often somewhat fashion inept - I certainly was. We’re unaware of important nuances in seasonal attire, age appropriate fashion & ideal make-up for various events. These skills often take years to perfect. This is the culture we now live in. When in Rome? Do as Romans do. Mentoring takes a lot of time from another’s life. We sometimes mistakenly assume the person is enjoying it completely since we’re usually talking about ourselves - everyone’s favorite topic. You need to go out of your way to do things for your mentor: cut her grass, fix her gutter, repair her computer - whatever you can offer. Time & investment is a two-way street. Where do you find a suitable transgender mentor? It’s not easy since it first requires a sense of connection for both parties. Additionally, there are still far few examples of transsexual women living a happy and healthy post-transition life worth emulating. You can sometimes connect with other transsexual women on-line through Facebook associations, etc. You can also meet such women at various gender conferences held annually across the globe. Be careful who you choose to emulate in the trans-community. I based my first mentor on her beautiful looks - and ended up emulating many of her unhealthy social and drug habits. The most important features to look for? Are they living the sort of quality of life you seek in your post-transition future? You can also simply choose to emulate the path and actions of another transgender without even knowing them: learning more about their story, their life, their ideas and decisions. Blogs from such ladies can become a great source of insight and consolation. It’s not easy to find a quality transsexual mentor that can help you directly. Direct help is exhausting! I directly assisted ten transsexual women through phases of transition - won’t do another. It’s a lot like people tired of parenting young children - and subsequently not wanting to be seated next to infants on a plane or in a restaurant. You reach an age – in trans-years…where you want to get on with the next phases of your life. Also, being close to a transition journey sometimes ignites memories of our own past misery that we really hoped to forget. If you find a much further along transsexual woman willing to help you? Treat her like gold! Listen and follow her advice. It takes a lot out of any adult to raise a child.